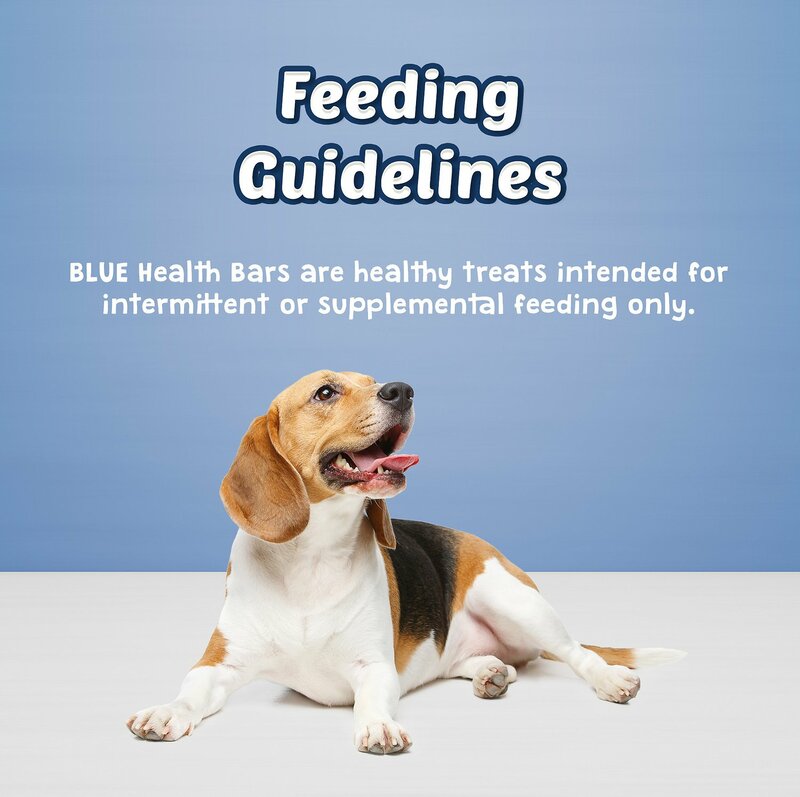 BLUE Health Bars are intended for intermittent or supplemental feeding only. I think the biscuits themselves are fine. However you should be aware that they are quite large. I broke them into 4 pcs and they were still plenty big for my 33# & 40# dogs. If you have a really large dog and want to give an occasional treat I think this is fine. However if you're just looking for a small nibble of a treat then perhaps this may be too big. I wish I had realized it was this size when I bought it and I probably would have chose something else. 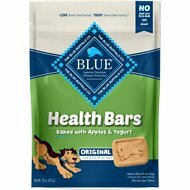 They are especially great for my older dogs as they aren't as hard to chew. They easily break in half although I cup my hand under them when I do break them as sometimes they break into several pieces and are a bit crumbly - which is why they are easier to handle for my little old guys. I have been giving these treats (all flavors) to my knuckleheads for years. They seem to love them and always ask for more. Daisy has skin allergies and sometimes Mitch does too so I am always careful what I give them. I know these are not 100% grain free but they do not seem to get any reaction from them. So we keep buying what makes the knuckleheads happy! 4 PAWS APPROVED! These are a good size treat. I break them into pieces for my small dog. The first time I gave one to her she dropped it and I thought she might not eat them. I guess she knew this Blue Buffalo Heath Bar was something different. She ate the piece she dropped and has been eating them every time I give them to her. 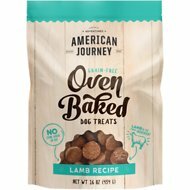 These cookies are large, I break them in two for our two miniature poodles, they love them, who wouldn't with bacon, cheese and egg. 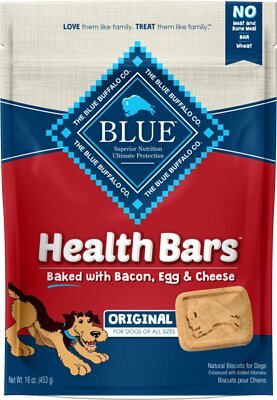 These are truly health bars, there is nothing bad in them, I can safely give them without feeling guilty of making them fat or creating a health problem. You can tell there is no fat or anything that could go bad and spoil like a lot of other treats. It is about time someone made something like this. Both of my boys love these treats! The only issue I have is every time I order these they come completely crumbled and crushed. To give them to my boys I have to dump the bag into my hand and they lick it from my hand. Going forward I don’t think I will continue to get these due to the mess and inconviene. I've had to move in with my daughter b/c of my disability. I came with my cat, whom had always eaten Blue products. Started getting my daughter to change over from a very well known "brand" name to Blue by buying them these biscuits! They took to them right away! Now they wait in their 'spot' when I wake, waiting for me to give them their daily snack! Love all the natural ingredients, smell tasty, though I've never tried one, not chemical, like others. Needless to say, my daughter & her dogs were slowly won over by Blue's superior products! My dogs love them. 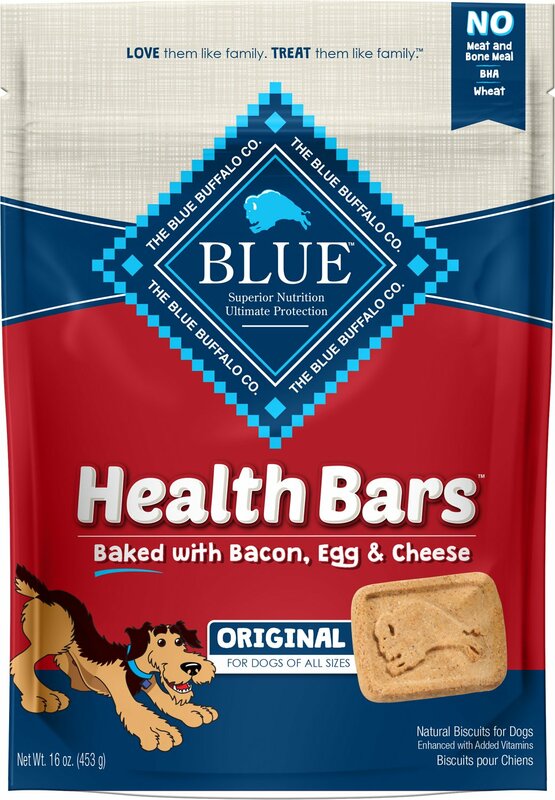 Whenever I give them one they run off while they eat it so another dog doesn't steal it away.I like these because I know they're made out of good ingredients that are healthy for my dogs. I got these for my 5 month old basset hound. I was a bit nervous since I didn't know how big these were. But they are perfect. They have a nice crunch but don't seem to be too hard for her. And she absolutely loves them. I can't move the box without her right there and big puddles of drool waiting for a treat. They don't smell too good though. But that won't keep me from ordering them again.